Review written by and copyright: Samuel Scott (16th March 2015). Arrow Films have released the infamous 1975 film "Rollerball" on to Blu-ray in the United Kingdom using the original aspect ratio 1.85:1. The feature receives an AVC MPEG-4 encode and is 1080p. This is easily the best I have ever seen the film look (US DVD and TV for previous viewings) though the transfer does appear to be from a dated master. 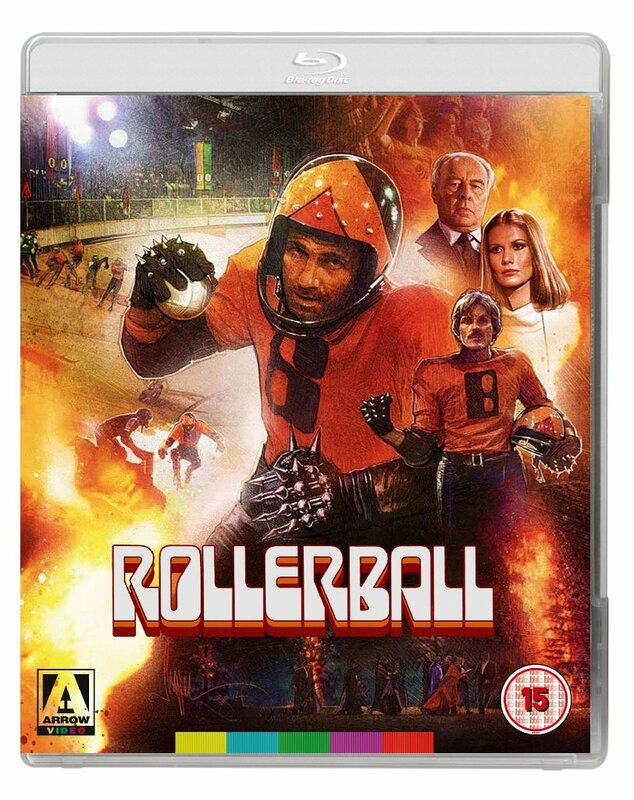 The feature starts off with an action-packed game of Rollerball, and it is here you can immediately see the increased levels of details that Blu-ray gives us over the older DVD releases. Details on various members of the crowd are solid, and facial close-ups on the players as they skate around the track are often excellent. Skin tones generally look natural, and other colours are fine, though there is certainly a slight reddish tinge to the whole transfer. Blacks are deep but there is some very minor crush in a couple of the shadowy scenes. There is a natural layer of film grain which becomes a little heavier during darkened moments. The transfer is clean in comparison to previous home media attempts, but there are still a few sporadic flecks of dirt from time to time, and a couple of white specks here and there, though nothing particularly problematic. There aren't any major blemishes to worry about, and I didn't notice any obvious banding or aliasing. There is no obvious use of digital noise reduction either. Overall, this is a strong transfer with a solid encode, which has room for improvement. The feature is uncut and runs 125:03. I flicked between the two tracks throughout my viewing, mainly edging towards the upmixed 5.1 track. Those who threat about upmixes sounding unnatural need not be afraid to sample this one, as only the score makes its way towards to the rears, staying faithful to the original mono mix. Dialogue sounds clear throughout with no mumbled speech and no problems with clarity. Effects also sound good despite the limitations of the sound design, with the roars of the crowd, the throttle of the motorbikes, and even some exploding trees helping the track to avoid sounding flat. Volume levels are consistent throughout and there are no signs of damage such as dropouts, scratches, or pops. No background hiss is present. Optional English HoH subtitles have been included. The first of two audio commentararies included here is with director Norman Jewison. This is a pretty sterling effort for a solo commentary and Jewison rarely slows down during the two hour duration. As in-depth as one could hope, Jewison talks about a wide range of aspects, from casting to locations, from sets to the speciel effects. Also included are several anecdotes, and various other tidbits. This was originally included on previous DVD releases. The second audio commentary is with writer William Harrison, who unfortunately suffers from having a number of dead spots in comparison to Jewison. However, what he does have to say is certainly interesting. He talks about the various differences between the end feature and his original story, the rules of "Rollerball", and even the capitalist, political, and violent aspects of the story. A joy to listen to if you can get past some minor periods of silence. Next up, found in the audio options, is an isolated music and effects track (LPCM 2.0). Truth be told, I sampled this very quickly as it simply isn't my type of thing. However, I know these tracks have their fans, so this is a great inclusion for them. "The Making of Rollerball" featurette clocks in at 25:04 and was originally made for the DVD over ten years ago. The featurette has interviews with various cast and crew members though Norman Jewison and William Harrison take the lead as they talk about how the film came about, and how certain elements came together. A lot of the information is covered in the commentaries, but we also get some solid input from others involved including stunt co-ordinator Max Klevin and John Beck who played Moonpie. Next up, we have "Blood Sports with James Caan", an interview with the lead actor running 10:59. Caan talks about various aspects of the story, his character, and his general involvement. This is an interesting retrospective interview that contains more detail than you get from most cast interviews these days. "The Fourth City: Shooting Rollerball in Munich" is a featurette in which unit manager Dieter Meyer and others revisit the Audi Dome and other original locations, clocking in at 18:54. Made by Fiction Factory, this is a really intriguing extra, and the type of thing that comes as a bit of a surprise as it is a little bit different to your typical supplement. Not only do we hear how the architecture of the Olympic basketball hall building attracted the film to Munich, we also get to hear a little about the history of the building since. A cracking addition! "The Bike Work: Craig R. Baxley on the Motorcycle Stunts in Rollerball " is our next featurette (17:33). Like the last extra, this too was made by Fiction Factory. Craig R. Baxley talks about the various stunts that they filmed on motorbikes for the action sequences in the film. He actually talks in some depth about the audition process for the stunt guys and how big a film it was in the stunt world at the time. He obviously had a great time in Munich and in being involved in the film in general, and that passion shines through in his detailing of the stunt work and the other stunt men. "From Rome to Rollerball" is the original EPK bringing together interviews and on-set footage (7:56). It draws comparisons between the game of Rollerball, and the gladiatorial contests of ancient Rome. It's an interesting piece but pales in comparison to the rest of the extras. A nice addition none-the-less. The on-disc extras end with a theatrical trailer (2:56), a theatrical teaser (0:58) and 3 TV spots (1:33). The release also comes with a reversible sleeve featuring original and newly commissioned artwork by Paul Shipper and a collector's booklet featuring new writing on the film, illustrated with original archive stills and posters.